Flat Valance (Pelmet) is excellent to cover the space visible at the track. 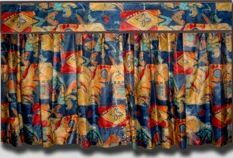 Excellent for Wheelhouse/Chart room curtains to block light at top of curtain. They can also be used to add style and enhance the appearance of the window covering. Flat Valances (Pelmets) are either self-lined, or blackout lined. Attaches to Velcro PVC 1” x 1” Flange with Velcro for easy installation and removal.